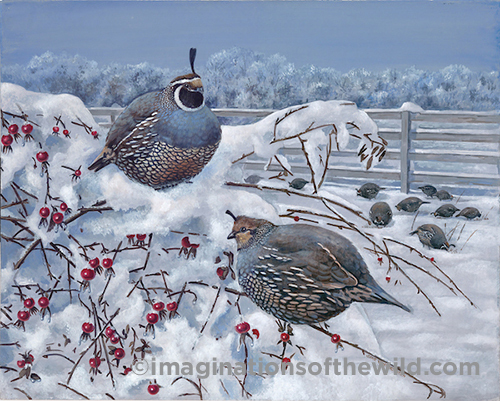 This "Sun Spot" acrylic painting of quail in the snow is the third in my quail painting series. The first was "Covey Sentinel," a painting of quail sitting on the fence in the fall. 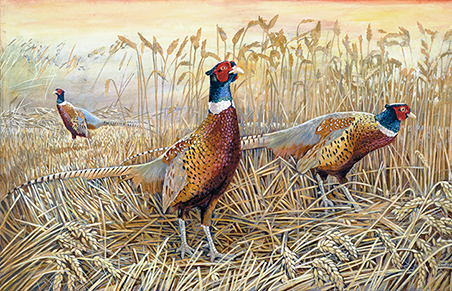 The second was "Spring Outing," a painting of a quail pair with their babies. Purchase art prints online or at my upcoming shows. Originals are also available at the art shows, galleries or call for more information and availability. 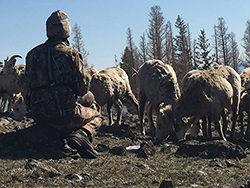 I was fortunate to go on a bighorn sheep viewing trip with the Oregon Department of Fish and Wildlife. They allowed me to get very close to the herd. 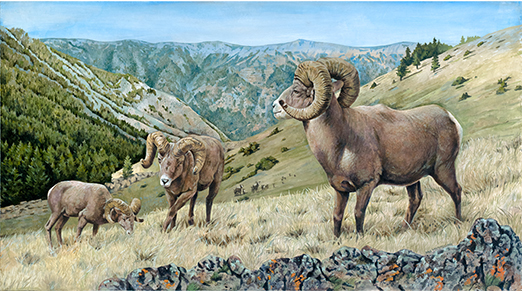 I used the picture reference taken during this trip for my bighorn painting and scratchboard drawing. Look for the new artwork in my booth at my upcoming shows. Stein Distillery Progress Ridge is featuring my artwork on their 50 foot art wall. This is a good opportunity to see a number of my original acrylic paintings and scratchboards at one time. The art show continues through the end of January. Stein Distillery is located on 12325 SW Horizon Blvd., #215, Beaverton, OR 97007. You can also view and purchase my artwork at the Sequoia Gallery+Studios, 126 SE 3rd Ave., Hillsboro, Oregon. In addition, my artwork and mugs are for sale at Chiloquin Two Rivers Art Gallery, 140 South 1st St., Chiloquin OR 97624. To purchase original acrylic paintings and scratchboard drawings, call or email to find out availability and price.